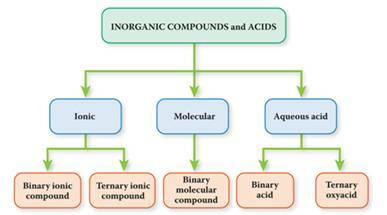 As you become an element expert in Chapter 3, compounds (Inorganic) are introduced in Section 3.5. Now it is time for you to become an expert at writing names and formulas of Inorganic Compounds. All Organic Compounds contain the element, carbon. How do I know which category an inorganic compound belongs? Sodium /ˈsoʊdiəm/ is a chemical element with symbol Na (from Greek Νάτριο) and atomic number 11. It is a soft, silver-white, highly reactive metal. In the Periodic table it is in column 1 (alkali metals), and like the other six elements in that column, it has a single electron in its outer shell that it readily donates, creating a positively charged atom—a cation. Its only stable isotope is 23Na. The free metal does not occur in nature, but must be prepared from compounds as it is highly reactive with water. Sodium is the sixth most abundant element in the Earth's crust, and exists in numerous minerals such as feldspars, sodalite and rock salt (NaCl). Many salts of sodium are highly water-soluble: sodium ions have been leached by the action of water from the Earth's minerals over eons; sodium and chlorine are the most common dissolved elements by weight in the oceans. When freshly cut, sodium has a bright, silvery luster. When exposed to air, the surface rapidly tarnishes, darkening at first and then forming a white coating of sodium hydroxide and sodium carbonate. Care is required in handling elemental sodium because it generates flammable hydrogen and caustic sodium hydroxide on contact with water; powdered sodium may spontaneously explode in the presence of an oxidizer. Chlorine is a chemical element with symbol Cl and atomic number 17. Chlorine is in the halogen group (17) and is the second lightest halogen, following fluorine. The element is a yellow-green diatomic gas under standard conditions. Chlorine has the highest electron affinity and the third highest electronegativity of all the reactive elements. For this reason, chlorine is a strong oxidizing agent. Free chlorine is rare on Earth, and is usually a result of direct or indirect oxidation by oxygen. The most common compound of chlorine, sodium chloride (common salt), has been known since ancient times. Sir Humphry Davy in 1810 named it from Ancient Greek: λωρός (khlôros) "pale green". Nearly all chlorine in the Earth's crust is in the form of ionic chloride compounds, which includes table salt. It is the second most abundant halogen and 21st most abundant chemical element in Earth's crust. Elemental chlorine at high concentrations is extremely dangerous and poisonous for all livingorganisms. Sodium chloride /ˌsoʊdiəm ˈklɔːraɪd/, also known as salt or halite, is an ionic compound with the chemical formula NaCl, representing a 1:1 ratio of sodium and chloride ions. Sodium chloride is the salt most responsible for the salinity of seawater and of the extracellular fluid of many multicellular organisms. In the form of edible or table salt it is commonly used as a condiment and food preservative. Large quantities of sodium chloride are used in many industrial processes, and it is a major source of sodium and chlorine compounds used as feedstocks for further chemical syntheses. A second major consumer of sodium chloride is de-icing of roadways in sub-freezing weather. Hard water contains calcium and magnesium ions that interfere with action of soap and contribute to the buildup of a scale or film of alkaline mineral deposits in household and industrial equipment and pipes. Commercial and residential water-softening units use ion exchange resins to remove the offending ions that cause the hardness. These resins are generated and regenerated using sodium chloride. Roman soldiers were not paid in coin but with salt. In 1954 Crest Toothpaste was born. It was the first tooth paste with fluoride to prevent cavities. [Tin(II) fluoride, commonly referred to commercially (with tin(II) in Latin) as stannous fluoride,is a chemical compound with the formula SnF2. It is a colorless solid used as an ingredient in toothpastes that are typically more expensive than those that use sodium fluoride. Stannous fluoride converts the calcium mineral apatite into fluorapatite, which makes tooth enamel more resistant to bacteria-generated acid attacks. In toothpastes containing calcium minerals, sodium fluoride becomes ineffective over time, while stannous fluoride remains effective in strengthening tooth enamel. Stannous fluoride has been shown to be more effective than sodium fluoride in reducing the incidence of dental caries and controlling gingivitis]. Your next objective is to learn to write the Names and Formulas of Inorganic Compounds in Section 3.5 by applying the riles from the Guidelines lised in the power point for chapter 3 or by viewing study guides highlighted in yellow below. Complete all 12 Tasks for Names and Formulas of Inorganic Compounds for 9 points (120 total compounds-10 compounds/task) and you must score 8 or more out of 10 to successfully complete the task. Using Chemical Date Bases/Web Search to fill in the above form and submit as an attachment to an email when Project #5 is complete. o The Health section conveys the health hazards of the material. In the latest version of HMIS®, the blue Health bar has two spaces, one for an asterisk and one for a numeric hazard rating. If present, the asterisk signifies a chronic health hazard, meaning that long-term exposure to the material could cause a health problem such as emphysema or kidney damage. NFPA lacks this important information because the NFPA system is meant only for emergency or acute (short-term) exposures. Life-threatening, major or permanent damage may result from single or repeated overexposures. Major injury likely unless prompt action is taken and medical treatment is given. Temporary or minor injury may occur. Irritation or minor reversible injury possible. No significant risk to health. 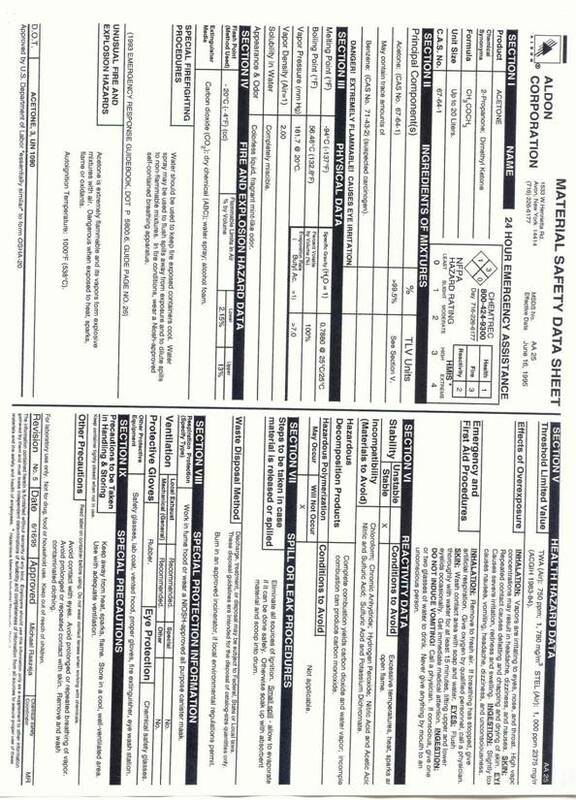 For HMIS I and II, the criteria used to assign numeric values (0 = low hazard to 4 = high hazard) are identical to those used by NFPA. In other words, in this category, the systems are identical. Flammable gases, or very volatile flammable liquids with flash points below 73 °F, and boiling points below 100 F. Materials may ignite spontaneously with air. (Class IA) . Materials capable of ignition under almost all normal temperature conditions. Includes flammable liquids with flash points below 73 °F and boiling points above 100 °F, as well as liquids with flash points between 73 °F and 100 °F. (Classes IB & IC). Materials which must be moderately heated or exposed to high ambient temperatures before ignition will occur. Includes liquids having a flash point at or above 100 °F but below 200 °F. (Classes II & IIIA). Materials that must be preheated before ignition will occur. Includes liquids, solids and semi solids having a flash point above 200 °F. (Class IIIB). Materials that will not burn. Materials that are readily capable of explosive water reaction, detonation or explosive decomposition, polymerization, or self-reaction at normal temperature and pressure. Materials that may form explosive mixtures with water and are capable of detonation or explosive reaction in the presence of a strong initiating source. Materials may polymerize, decompose, self-react, or undergo other chemical change at normal temperature and pressure with moderate risk of explosion. Materials that are unstable and may undergo violent chemical changes at normal temperature and pressure with low risk for explosion. Materials may react violently with water or form peroxides upon exposure to air. Materials that are normally stable but can become unstable (self-react) at high temperatures and pressures. Materials may react non-violently with water or undergo hazardous polymerization in the absence of inhibitors. Materials that are normally stable, even under fire conditions, and will not react with water, polymerize, decompose , condense, or self-react. Non-explosives. 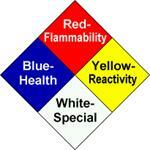 o This is by far the largest area of difference between the NFPA and HMIS® systems. 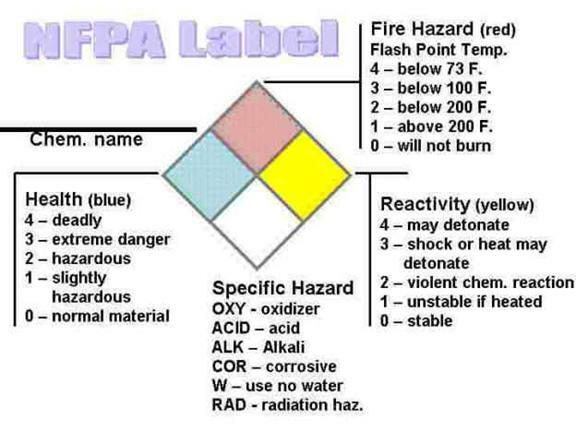 In the NFPA system, the white area is used to convey special hazards whereas HMIS® uses the white section to indicate what personal protective equipment (PPE) should be used when working with the material. Note: The NPCA specifically recommends that "preparers of MSDSs should not place HMIS® PPE designation codes on the MSDSs or labels that leave the facility, as they do not know the conditions under which their customers use those products." However, these still turn up on some MSDS's. HMIS® uses a letter coding system for this section. We at ILPI find this unacceptable because we would rather see the PPE listed explicitly instead of having employees try to remember a bunch of codes or consult a chart, something that could lead to confusion and/or a fatal accident. Likewise, the "custom codes" aspect is particularly dangerous for visitors and contractors who may not remember/recognize that these could vary from job site to job site. Note: Some of the letters/symbols used in this table are also used as TSCA, CHIP, and/or DoD HMIRS/HCC codes, all of which have completely different meanings and applications! Say, did we tell you we dislike code systems? 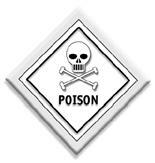 As a lay person do not let an employer make you handle a chemical on the job without the proper protection. This exercise to search a data base for information about a chemical and its hazards should be taken seriously. Before you search the chemical data base to look up the MSDS data, Google the chemical and read the general information about the chemical such as presented above in some the examples above.